The calcaneal spur, or heel pain, is an orthopedic problem arising due to abnormal growth of a part of the heel bone, forming a bulge, which can cause severe pain in the sole of the foot. Calcaneus is the name given to the heel bone. The calcaneal spur is a bony protuberance, which usually appears at the base of the calcaneus; the sole of the foot. Another place where the spur may arise is in the posterior calcaneus near the insertion of the Achilles tendon. The spur usually develops due to microtrauma and chronic inflammation of the lower heel, affecting not only the calcaneus bone, but also the tendons and plantar fascia (ligament located on the soles of the feet, one end of which is attached to the heel bone). The multiple microtrauma and chronic inflammation over several months promote tissue calcification around the heel bone, which leads to the formation of spurs. 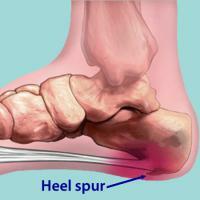 Any situation that causes chronic stress on the heel region may cause the development of a spur. As one end of the plantar fascia is attached to the base of the calcaneus, plantar fasciitis (inflammation of the fascia) has the same risk factors that heel spurs; common coexistence of two orthopedic problems is also common. The heel spurs often show little or no symptoms. The existence of a spur is not enough to cause pain for approximately 95% of patients. For pain to arise there must also be inflammation in the area around the heel, usually with involvement of the plantar fascia. Despite having a pointed shape, the pain of the spur does not usually occur at some structure around it. The pain arises by the local inflammatory process which is triggered by repetitive microtrauma. In general, patients with heel spurs who complain of pain also present the framework of plantar fasciitis (it's good to note that the heel spur does not cause plantar fasciitis). Therefore, the spur itself does not cause pain in the feet. The spur is only an indirect sign that the region of the heel was exposed to repeated stresses and traumas in recent months or years. When there is no local inflammation the most common symptom is pain in the foot, especially in the region below the heel. The pain is typically worse during the first steps, like getting out of bed in the morning or stand up after sitting for a while. The treatment of heel spur is only necessary when there is inflammation of the tissues around, usually in the form of plantar fasciitis. Initially, the control of inflammation can be done with ice and resting place. In tougher cases other options are physical therapy, with specific exercises and stretches for the calves and feet, and wearing shoes with special insoles to reduce pressure on the heel and plantar fascia. 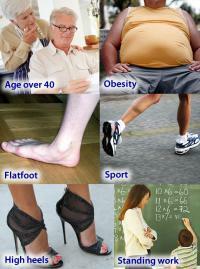 Obese people should lose weight to reduce the stress caused by excess weight on the feet. If there are no contraindications, the use of anti-inflammatory drugs for short periods helps a lot in controlling the inflammatory process. Injections of corticosteroids in the heel may be used in cases where there is no satisfactory response to conservative treatment. The surgery to remove the spur is the last alternative and currently is rarely indicated, because the vast majority of patients can control pain with conservative measures. Can Contraceptive Pills Cause Cancer? Can You Become Pregnant Being Menstruating?